Our company produces packaging steel strap for packaging, fixing and transportation of cargoes as per DIN EN 13246:2001 and DIN EN 13247:2001,which is used in EN countries. According to regulated European standards strap can be of galvanized or non-galvanized state, painted and waxed. This product is manufactured at the “high-strength packaging strap” shop. * – The price is indicated only for small-scale wholesale and Ex-Works shipping( minimum value – 1 ton, loading characteristics are presented at “Packing” tab). Express shipping of packaging strap is possible only for positions presented at “In stock” tab. The price for strap shipped with carload and FTL norms is adjusted individually. Steel grades are not regulated. Steel strap as per DIN EN 13246:2001 is produced from cold-rolled steel without any treatment(type 1), heat-treated and tempered(type 2.1 and 2.2) and heat-treated(type 3.1,3.2 and 3.3). The company has developed and implemented an integrated management system (IMS), confirmed by the compliance certificate. 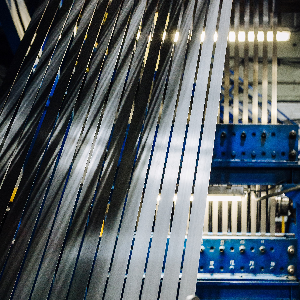 The certificate confirms that cold-rolled steel strapping as per DIN EN 13246:2001 and DIN EN 13247:2001 is produced in accordance with the requirements of GOST ISO 9001-2011 (ISO 9001:2008), GOST R 54934-2012 (OHSAS 18001:2007), GOST (ISO 14001:2004). Minimum yield tensile strength and elongation of steel strapping are regulated by EN 10002-1 and tested on samples of 100mm length. Сamber, bending and curling tests of the strap DIN EN 13246:2001 and DIN EN 13247:2001 are carried out on samples of 2000mm (see pict.). Camber deviation(2) must not be more than 10mm(1). Strap end must not rise higher than 40mm(4) while bending(3). Strap curling(5) can not exceed 30°(6). Strap edges shall have no burrs and grooves. Dimensions Min. breaking load, kN Percentage of elongation L=100, %, min. Packing of finished products is carried out in accordance with the requirements of GOST 3560-73, GOST 503-81 and other normative documents as well as the schemes agreed with the customer on. 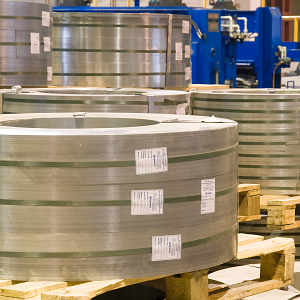 Each coil is obligatory to be banded at least in three positions through an inner coil diameter. Packing of coils can be done both on vertical and horizontal axis. Strap of ribbon winding is placed on a wooden pallet. 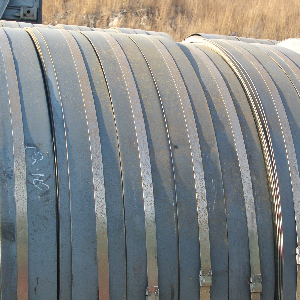 Strip coils are put together in piles with or without wooden fillers between. 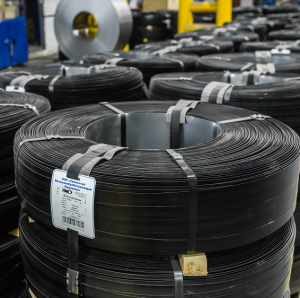 Coils are put together in piles, placed on wooden pallets, banded by steel strapping and wrapped in paper as well as film tape. On customer’s request lower coil may be wrapped in polypropylene film or paper. Производство перфорированной ленты ориентировано на изготовление таких видов продукции как лента монтажная, лента крепежная и изготовления крепежных изделий, в том числе для крепления оцинкованных профилей.